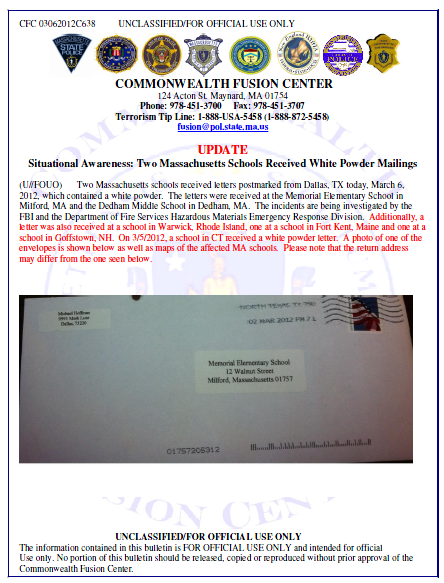 (U//FOUO) Two Massachusetts schools received letters postmarked from Dallas, TX today, March 6, 2012, which contained a white powder. The letters were received at the Memorial Elementary School in Milford, MA and the Dedham Middle School in Dedham, MA. The incidents are being investigated by the FBI and the Department of Fire Services Hazardous Materials Emergency Response Division. Additionally, a letter was also received at a school in Warwick, Rhode Island, one at a school in Fort Kent, Maine and one at a school in Goffstown, NH. On 3/5/2012, a school in CT received a white powder letter. A photo of one of the envelopes is shown below as well as maps of the affected MA schools. Please note that the return address may differ from the one seen below. (U/FOUO) If your jurisdiction receives a letter of this type, please do not move the letter. Isolate the letter and seal off the room in which the letter was opened along with the party who opened the letter. Notify local law enforcement to engage the local FBI office or Joint Terrorism Task Force and activate the District Hazardous Materials Emergency Response Team for a Tier 1 response.